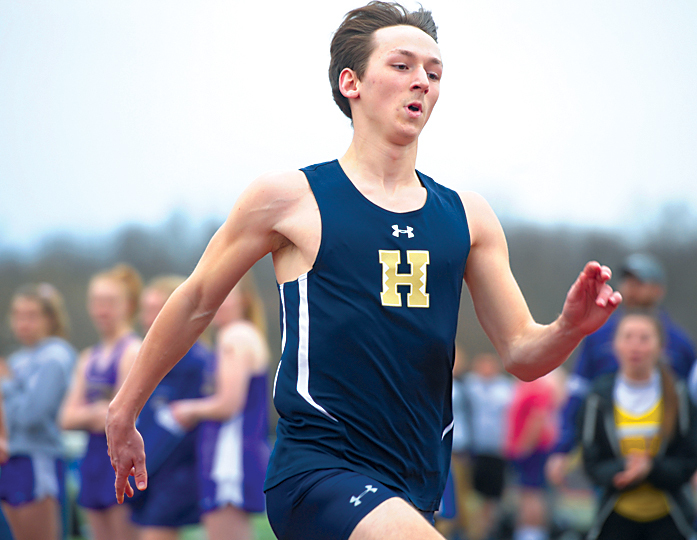 HOLLIDAYSBURG — The Hollidaysburg boys defeated Bellwood-Antis, 99-51, and Bishop Guilfoyle, 130-19, in high school track Thursday. The Bellwood boys topped BG, 117-29. Trent Howe won the 100 and 400 dashes and anchored the winning 1600 relay. Dylan Hayford prevailed in the high and triple jumps. Bellwood’s Joe Wertz won the shot put and discus, and Dylan Wilson won both hurdles. The Hollidaysburg girls defeated Bellwood-Antis, 107-43, and BG, 111-35. Darcie Frazier won the 200 dash, long jump and shot put, and Aly Snyder won both hurdles races. The Bellwood girls topped BG, 88-58. 100 dash: 1 Howe H 11.3; 2 Wolfe BA 11.75; 3 Zimmerman H 11.83. 200 dash: 1 Wolfe BA 23.5; 2 Lindsey H 24.5; 3 Grabill H 24.6. 400 dash: 1 Howe H 52.4; 2 Grabill H 53.6; 3 Frye BA 58.6. 800 run: 1 Wedel H 2:12; 2 Wilkinson H 2:14; 3 Jones H 2:16. 1600 run: 1 B.Love H 4:58; 2 Wedel H 4:59; 3 Wilkinson H 5:00. 3200 run: 1 C. Love H 10:53; 2 Wilkinson H 11:54; 3 DeFlaviano H 11:54. 110 hurdles: 1Wilson BA 18.53; 2 Fox BG 18.65; 3 Zimmerman H 18.78. 300 hurdles: 1 Wilson BA 45.25; 2 Zimmerman H 46.88; 3 Cuevas BA 51.76. 100 dash: 1, Wenner BA 13.1; 2, Miller H 13.3; 3, Snowberger H 13.7. 200 dash: 1, Frazier H 27.1; 2, Guthrie H 29.8; 3, Mcartnery BA 30.1. 400 dash: 1, Delattre H 1:06.5; 2, Burk H 1:07.6; 3, Yingling BA 1:09.3. 800 run: 1, Heisler BA 2:57.6; 2, Campbell BA 2:58.4; 3 Longsinger BA 3:01.1. 1600 run: 1, McClain H 5:454.0; 2, Bartlett BA 6:16.1; 3, Yohn BA 6:47.1. 3200 run: 1, Bartlett BA 13:37; 2, Yohn BA 15:276; 3, McIntire 16:20. 110 hurdles: 1, Snyder H 17.2; 2Burke H 18.0; 3, Everett H 19.2. 300 hurdles: 1, Snyder H 52.8; 2, Everett H 54.8; 3, Focht BA 55.7. 400 relay: 1, Hollidaysburg (McCall, Tryninewski, Snowberger, Miller), 53.8. 1600 relay: 1, Hollidaysburg (McClain, Burk, Tryninewski, Delattre), 4:25.2. 3200 relay: 1, Bellwood (Campbell, Heisler, Longsinger, Yingling), 11:34.6. High jump: 1, Brunner BG 5-2; 2, Jodon H 5-0; 3, Isenberg H 4-10. Long jump: 1, Frazier H 17-3; 2, Parnell H 14-2; 3, Snowberger 13-10. Triple jump: 1, Parnell H 33-4; 2, Miller H 32-5; 3, Delattre H 31-2. Shot put: 1, Frazier H 30-4; 2, Georgiana BG 26-10; 3, A Sipes H 25-2. Discus: 1, Rinker H 76-6; 2, Shook BA 75-9; 3 Engle BA 74-0. Javelin: 1, Georgiana BG 86-5; 2, Frazier H 85-7; 3, Ellis H 70-0. Pole vault: 1, Isenberg H 9-0; 2, Wilt H 8-6; 3, Shuke BA 8-6. Records: Bellwood-Antis boys (1-2); Bishop Guilfoyle boys (0-2); Hollidaysburg boys (3-0). EBENSBURG — Harrison Brumbaugh and Michael McCloskey were double-winners in the Central Cambria boys’ season-opening win over Purchase Line, 121-28. Brumbaugh, who also ran the first leg of the winning 400 and 1600 relays, took first in the 100 and 200 dash, while McCloskey won the 110 and 300 hurdles. In girls action, the Lady Devils topped Purchase Line, 129-21. Paige Wess took first in the 100 and 200 dashes as well as the 300 hurdles. 100 dash: 1, Brumbaugh, CC, 11.6; 2, O’Brien, CC, 11.7; 3, Steffen, CC, 12.2. 200 dash: 1, Brumbaugh, CC, 24.2; 2, O’Brien, CC, 24.3; 3, Steffen, CC, 24.8. 400 dash: 1, Garzarelli, CC, 54.7; 2, Melnyk, CC, 56.6; 3, Day, PL, 56.7. 800 run: 1, Roberts, CC, 2.05; 2, Kuntz, CC, 2.14; 3, Wandel, CC, 2.15. 1600 run: 1, Cree, CC, 5.05; 2, Kuntz, CC, 5: 05.3; 3, Vyas, CC, 5:06.7. 3200 run: 1, Vyas, CC, 11.05; 2, Haycisayc, CC, 11.40; 3, Shuagis, CC, 11.40. 110 hurdles: 1, McCloskey, CC, 17.2; 2, Lazer, CC, 17.7; 3, Grata, CC, 19.1. 300 hurdles: 1, McCloskey, CC, 45.5; 2, Grata, CC, 46.0; 3, Orange, CC, 47.8. 400 relay: 1, Central Cambria (Brumbaugh, O’Brien, Gauden, Steffen) 46.1. 1600 relay: 1, Central Cambria (Brumbaugh, Garzarelli, Melnyk, Steffen), 3.58. 3200 relay: 1, Central Cambria (Roberts, Wandel, Lechleitner, Kuntz) 8.50. High jump: 1, Koss, CC, 5-2; 2, Gillin, CC, 5-0; 3, Antisdel, PL, 4-10. Long jump: 1, Melnyk, CC, 18-11.5; 2, Gillin, CC, 17-4; 3, Koss, CC, 17-8.75. Triple jump: 1, Roberts, CC, 37-1; 2, Ford, CC, 32-9; 3, Beyer, CC, 32-4.5. Shot put: 1, Scalese, PL, 47-2; 2, Goncher, PL, 43-4; 3, Gooderham, PL, 36-9. Discus: no event. Javelin: 1, Fyock, PL, 135.2; 2, Huey, PL, 129.3; 3, Scalese, PL, 114.3. Pole vault: 1, Lechleitner, CC, 10-6; 2, Lazer, CC, 8-0. 100 dash: 1, Wess, CC, 13.7; 2,Smith,PL, 15.45; 3, Primus, CC, 15.5. 200 dash: 1, Wess, CC, 29.2; 2, Russel, CC, 29.7; 3, Ward, PL, 30.6. 400 dash: 1, Vrabel, CC, 1.05; 2, Ratchford, CC, 1.06; 3, Balaugh, PL, 1.09. 800 run: 1, Wilson, CC, 2.36; 2, Dill, CC, 2.45; 3, Kutchman, CC, 2.53. 1600 run: 1, Wilson, CC, 5.50; 2, Kuntz, CC, 6.00; 3, Mckeel, CC, 6.10. 3200 run: 1, Kuntz, CC, 12.14; 2, Mckeel, CC, 13.18; 3, Leamer, PL, 14.48. 100 hurdles: 1, Woods, CC, 18.6; 2, Moss, CC, 20.0; 3, Lambie, CC, 22.2. 300 hurdles: 1, Wess, CC, 48.9; 2, Walwro, CC, 51.2; 3, Gerlach, CC, 54.8. 400 relay: 1, Central Cambria (C. Russell, Primus, Fox, J. Russell), 56.7. 1600 relay: 1, Central Cambria (Walwro, Ratchford, Vrabel, Wess), 4.33. 3200 relay: 1, Central Cambria (Dill, Gerlach, Vrabel, Wilson), 10.49. High jump: 1, Walwro, CC, 4-8; 2 Novitski, CC, 4-6; 3 Woods,CC, 4-4. Long jump: 1, Syster, PL, 14-1 2, Novitski, CC, 137-7.5; 3, Fox, CC, 13-2.5. Triple jump: 1, Fox, CC, 30-0.5; 2, J. Russell, CC, 28-11 3, Holtz, CC, 28-2.25. Shot put: 1, Koss, CC, 30-6.5; 2, Mckendree; 3,. Discus: 1, Sikora, CC, 75-11; 2, Bingaman, PL, 72-11; 3, Cree, CC, 71-10. Javelin: 1, Beer, PL, 101-9; 2, Bauer, CC, 101-7 3, Ward, PL, 98-8. Pole vault: 1, Gerlach, CC, 7-6 2, Kovash, CC, 6-0; 3, Fox, CC, 5-6. Records: Purchae Line boys (0-1), girls (0-1); Central Cambria boys (1-1), girls (2-0). WINDBER — Logan Pfister swept the three jumps to help the Chestnut Ridge boys defeat Windber, 95-54. Pfister jumped 20-10.5 in the long jump, 40-6 in the triple jump and 6-0 in the high jump. Duane Knisely won the shot put (51-6) and discus (171-8), and Austin Crocker won the 110 hurdles (17.2) and 100 dash (11.9). Crocker and Pfister were also part of the winning 1600 relay. The Ridge girls fell to Windber, 73-72. Ridge junior Audrianna Barnes won the javelin (89-3) and pole vault (7-0). ALEXANDRIA — The Juniata Valley boys and girls picked up dominant victories over Williamsburg while also defeating McConnellsburg. The JV girls won, 118-18, over Williamsburg, thanks to triple-winners Halee Smith and Maddy Beasom. Smith won the 110 hurdles, 300 hurdles and triple jump, while Beasom won the discus, javelin and pole vault. Morgan Hess won the 1600 and 3200 runs. In boys action, the Hornets topped Williamsburg, 103-32. Jefferson Hill claimed the top spot in the 110 and 300 hurdles as well as the triple jump, while double-winners included Jack Zurybida (1600, 3200), Elliott Showalter (shot put, discus) Devin Diehl (javelin, pole vault) and Dyland James (long jump, high jump). The JV boys beat McConnellsburg, 92-56. SAXTON — Meghan Molosky was a triple-winner for the Tussey Mountain girls in a 69.5-62.5 win against West Branch. Molosky finished first in the 100 dash (13.00), 200 dash (27.9) and the long jump (14-2). The Tussey boys edged out West Branch, 77-72. ARMAGH — Bishop Carroll defeated United, 86-63 in boys, and 81-62 in girls, in a meet from Wednesday. For the girls, Maddie Murphy earned wins in the 100 dash (13.74), long jump (15-9) and triple jump (36-6.25), while Maizee Fry won the discus (118) and shot put (35-11). Ryan Bohrer took first place for the boys in the long jump (16-8.75) and high jump (5-6), while Trevor Hogue won the discus (130-1) and shot put (40-5).